Hello and welcome friends and followers! 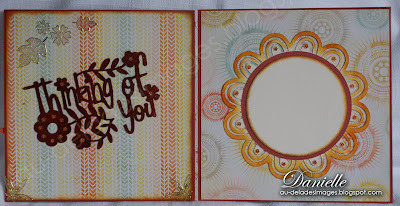 Today, our theme at our friendly challenge is using a background stamp. I love Magnolia backgrounds and I have chosen Sunny Autumn Morning from last year Turning Leaves collection, along with Tilda with corn to make my card. I love mushrooms, and enjoyed coloring this pretty image with my copics. I kept embellishments very simple to put the spot light on the images. I remained in a country theme by transferring the sentiment letters on a little piece of wood, the cute mushrooms are from Recollection. Aujourd'hui le thème de notre défi est d'utiliser une étampe de fond. 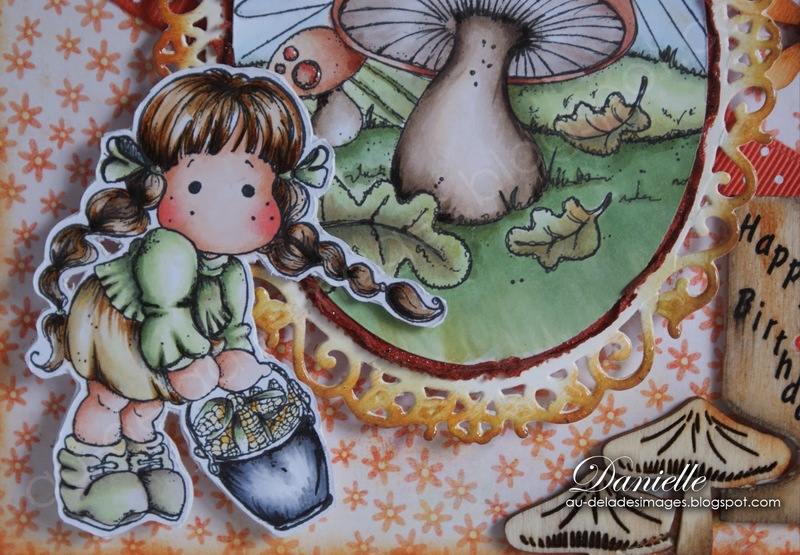 J,adore les fonds Magnolia et j,ai choisi Sunny Autumn Morning de la collection Turning Leaves. J'aime les champignons et je me suis beaucoup amusée à colorier cette image avec mes copics. Je voulais donner toute la place à ces images, mes décorations sont minimales. Pour donner un style champêtre, j'ai transféré le sentiment sur une plaquette de bois, et complété le tout avec des jolis champignons de Recollection. Inside, I used my Cricut to cut the letters and the flower decorating the blank space for sentiment. 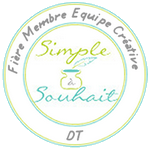 C'est avec ma Cricut que j'ai coupé le message intérieur et la jolie fleur sous l'espace prévu pourles sentiments. I decorated the matching Boitatou also with my Cricut. 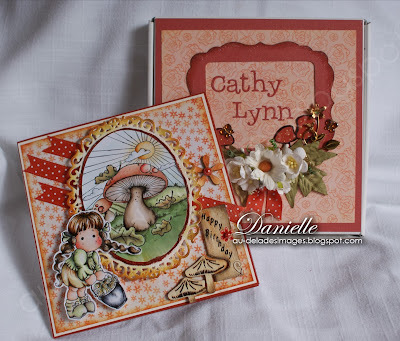 The cute little frame has mushrooms ... well now Cathy Lynn, you will not have a surprise when you open your package, but ... of course, seeing it in real, gives another perspective! Speaking of Boitatou, I have been creating different styles of Boitatou, using them as a base for mixed media. I will share with you my different experiences very soon! I must tell you that I had fun, and just let myself free in style, and with different mediums. parlant de Boitatou, j,ai 3 projets à afficher bientôt. Je me suis servie de la boite comme medium de base pour explorer des techniques de mixed media! c'est à suivre prochainement. I have been playing a lot with my camera, trying to take a picture a day ! well some days, it is as ordinary as my cup of tea, or a book I am reading. Last week, we worked hard! we made our own wine, we do this each year! I share with you my picture of the day, this is the second step after removing the stems from the grapes, and letting ferment for a week ! J,ai aussi beaucoup joué avec ma caméra dernièrement! Mon projet d'une photo par jour! parfois je les mets sur Facebook, et c'est aussi banal que ma tasse de thé, ou le livre que je lis. mais aujourd'hui, j'ai immortalisé une tradition chez nous, nous faisons notre vin depuis très longtemps. Je vous partage ces moments alors que nous en étions à la deuxième étape: le pressage! Wowzers Danielle, this is gorgeous. Your coloring is as always spectacular, another WOW. I totally agree with you about the embellishments but the one you used are awesome, gorgeous. Cathy-lynn will be thrilled when she open the amazing beautiful giftbox. Also the inside of the card is lovely. You did a amazing job with this challenges. So, about the wine, when I show this to my husband I think he will book a flight immediately to Canada LOL. Oh my goodness Danielle this is totally beautiful! Yes I am a country girl and you've created a familiar scene to me. I love it and now can not wait until the mailman delivers. All so beautiful and you coloring is pure delight. Now I hope you include a bottle of wine with that card. LOL!! (even though have not drank for over 25 yrs. but what the heck!) Your card and box are totally stunning and I will treasure this set! What a lucky birthday girl!!! Beautiful card, love the scene and wooden piece!! Superb Danielle!!! Wow, this is soooo gorgeous! I love all the details and the box you made is a perfect match with the card! 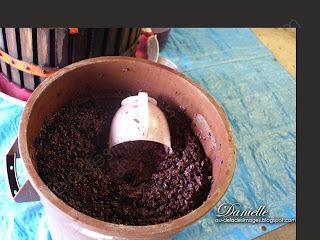 Love the pics of you making wine...do you also have to put out your shoes and trample the grapes? ha, ha, I don't think so, but maybe it helps to get a better taste? Cathy Lynn will love it!!! How could she not???? Your coloring is superb and I adore the exquisite presentation box....outstanding job! Would love to try your wine!!! Wow wow wow! This is AMAAZING Dear Danielle!!!!!!! Your colouring and your scene is BRILLIANT! Looove it so very much and I know your friend will go head over heels with this!!!! And the inside is just absolutely GORGEOUS as well! Wowwwww! 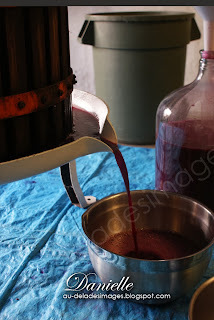 Now I loved seeing the photos you took of your wine making! I've never seen this before! I would have pictured in my mind you stepping in a big tub of grapes and squishing it with your feet! lol!!!!! I find it sooooo INTRIGUING that you make your own wine! How AWESOME is that?!!!!! Gorgeous card, Danielle. Wonderful autumn scene--I just luv mushrooms. Fab colouring and colour scheme. Beautiful inside and outside as well as the matching box. Oh good for you for making your own wine. I'm always impressed with people who can do this. Danielle!!!! Wow! This is gorgeous! Your coloring is so wonderful with the copics!! Love the cute background and Fall colors!! Your friend will love it! I can't believe you made your own wine! That is so cool. 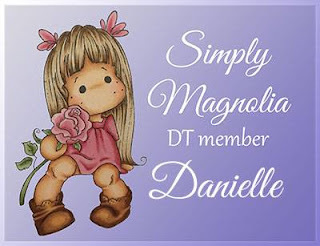 Danielle, what a beautiful gift you have made!!! Oh que cest beau!!! Tu as beaucoup de talent jadore toujours ce que tu fais! Des merveilles pour mes yeux! De superbes détails, une mise en couleur des plus réussies... un ensemble cadeau parfait!!! C'est super beau Danielle encore une fois. Tu nous epateras toujours avec tes projets tout aussi beaux les uns que les autres. Les couleurs sont belles, l'image est jolie et l'ensemble carte et boite a tout est parfait. Je suis sur que ton amie va adorer.